Newton County is made up of parts of Henry, Jasper and Walton counties and dates to 1821. Its name honors Sergeant John Newton, a companion of the Revolutionary War hero William Jasper. Covington, the county seat, is named for Patriot General Leonard Covington. 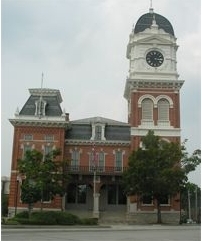 The Dec. 1821 legislation creating Newton County authorized the county's first inferior court to purchase up to 202.5 acres for locating a courthouse and jail and laying out town lots, the sale of which would go toward the expense of erecting public buildings. Until a courthouse could be built, the legislation provided that elections and court sessions be held at the house of Martin Robb. Jordan and Puster report that a one-room log courtroom was built at Brick House (ten miles east of present-day Covington) in 1822 at a total price of $62. A two-room log courtroom was built in Covington -- probably in 1822 or 1823. Possibly, this structure was replaced by a more substantial courthouse. In any event, the building serving as courthouse burned on the final day of 1883. The current courthouse was built on the site of its predecessor in 1884. One of the best-known of all Georgia county courthouses, the building was repeatedly featured in the television show, In The Heat of the Night. 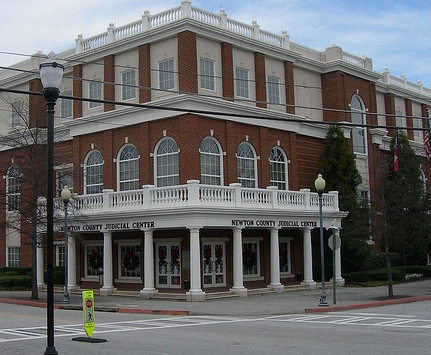 The series was filmed locally, and settings within the city of Covington served as places for the fictional Georgia town of Sparta, where the series took place. The Newton County Judicial Center Dedication was held on May 4, 1999. The new building is located directly behind the historic courthouse. United States Supreme Court Associate Justice Anthony M. Kennedy and Governor Roy Barnes were on hand for the dedication ceremony. Judge Samuel D. Ozburn talked about the preparations for the dedication of the courthouse in Newton County, Georgia. Following his interview, Associate Justice Kennedy talked about the importance of law to the country's infrastructure. He stressed that the economy would not prosper without the law. He also talked about the privilege of jury duty and the unique chance it gives citizens to be directly involved in the government. On October 19, 2018, United States Supreme Court Associate Justice Clarence Thomas spoke at the dedication ceremony of the new addition to the Newton County Judicial Center.